Here are a bunch of questions I get asked all the time! If you have a question that isn’t answered here, feel free to email me via the contact page, or message me on social media! How long have you been crocheting and how did you learn? I learned how to crochet (and knit!) the summer after I graduated high school, in 2007! It was a great way to unwind after 12 very long years hahaha. I learned by watching youtube videos. 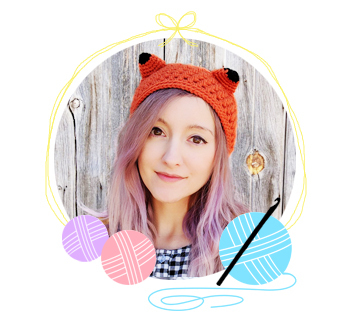 How can I learn to crochet? Do what I did: watch youtube videos! There are so freaking many of them available, completely for free! What are some good beginner patterns? Well you can try some of my free patterns, but honestly I’d start with youtube. Just type “beginner crochet pattern” into search and see what comes up! I’ve tried it a few times in the past, and I can honestly say that I hate making videos. It’s very time consuming and tedious. Sorry, it’s probably not gonna happen. What yarns do you use? I want to start writing crochet patterns. Do you have any advice? How did you get started selling patterns?